Above: Coach Lathrop on the sidelines with members of his soccer team. Being goal oriented, a good strategist and a patient person all are traits that Sen. Steve Lathrop utilizes as a state senator. They also make him a great soccer coach. 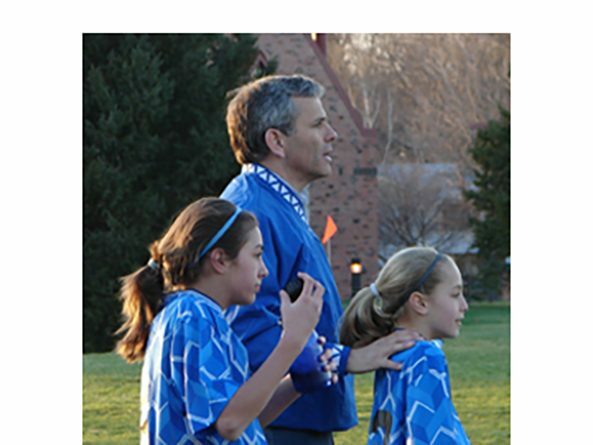 Being the father of four daughters, he’s found coaching soccer and softball to be a great opportunity to spend time with them. “I get to know their friends and the kids in their class,” he said. His interests go beyond spectator sports, though. He looks forward to annual skiing trips with his daughters, and works in golf games when he can. Every February, he tries to go somewhere warm to go scuba diving and escape the cold weather. “I try to do that once a year, but this legislative gig is interfering with scuba diving” he joked. Lathrop, one of nine children, grew up in the Benson area of north Omaha and attended Archbishop Rummel’s all-boys school. Later, he attended Creighton University, earning a bachelor’s degree in business and a law degree, like his father had after serving in World War II. His father’s career as an Omaha trial attorney inspired the younger Lathrop to become a lawyer when he grew up, a goal that he set as early as the seventh grade. He met that goal and three of his brothers did the same. “It’s a family thing,” he said, adding that he still enjoys practicing law after 25 years. His siblings are now scattered around the country (and Canada), but they still get together for a family reunion every summer in Minnesota, where they rent several cabins to catch up and spend time together. He credits their help, in part, for a successful campaign for the 12th legislative district seat. They all came back to Omaha to knock on people’s doors throughout the district and tell people how their brother would make a great state senator. Since he won by only 14 votes out of 11,000, Lathrop said every person who voted for him and helped with his campaign made all the difference. Lathrop had wanted to run for office for a long time, but waited until his children were older and he could afford to do so, he said. He’s found the 48 other senators he serves with to be “remarkable, thoughtful people.” He said he was struck by how much the Legislature is a true cross-section of the state, with people coming from all walks of life: mayors, Ph.Ds, medical doctors, farmers, ranchers, grocers, social workers, and engineers. Lathrop said he was pleased to discover that a nonpartisan legislature actually does work in practice most of the time. He hasn’t seen the partisan split on issues that other state legislatures experience. Instead, senators’ votes are based on how they think, allowing them to be more honest with their vote, he said. Lathrop, like other new senators, is discovering that serving in the Legislature can be a life-changing experience. Everywhere he goes, people want to talk to him about an issue, from schools to the death penalty to taxes. Luckily, Lathrop likes talking policy, so he’s happy to do it. Just not on Tuesday and Thursday nights.